We’ve all done something we regret. If you haven’t done something you haven’t regretted doing, you aren’t living. However just like with anything there are certain choices that we’ll regret without even remembering we made those choices. It’s a dark rabbit hole to follow but plenty of us have been there. Next thing you know, you find yourself in a situation that you don’t remember putting yourself in and you regret everything that you’ve ever done. Life comes at you fast. Warning the following review will contain spoilers. So remember to read your comic before reading on, You have been warned. You know what I instantly loved about this issue? 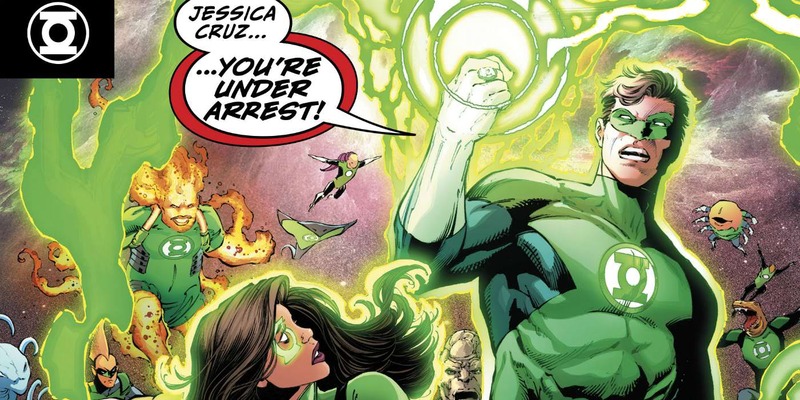 You as the reader are in the same boat as Jessica Cruz, you have no earthly idea what is going on and you’re forced to go along with the ride. Given the happy ending for Cruz, opening this issue is a complete 180 turn. In certain cases when a writer does pull this trick it can potentially make the reader believe they missed a chapter and that can force them to stop reading. Thankfully (DC Writer Workshop Graduate) Aaron Gillespie quickly depicts Cruz being utterly confused, so the chances of a maintained confusion won’t last long. The overall tone of this issue felt extremely different from previous chapters of Seeley’s run. This issue didn’t share similar aspects that one might find when reading a Green Lantern story. This felt more like a suspense thriller. There are few moments where Jessica is allowed to slow down and try to asses what might have lead her to this predicament. Even during moments of perceived calm, the tense atmosphere doesn’t leave the scene, it sticks with you unrelenting until that tension breaks out into a exciting chase scene. In addition this issue is a great indication of how Jessica has been improving as a character. Even though the events within the comic do lead her to drinking for the first time, Jessica still maintains her cool despite her situation, she isn’t wilting like she would have done earlier in her career. Ronan Cliquet pencils for this issue are absolutely stunning. Of course I’m going to shine the light on his storytelling, because you need tip top sequential for a story like this one. Plus I really enjoyed the small character choices that Cliquet sprinkles into certain panels, it adds more depth than a reader might look it. So for those who do look at every nook and cranny of a comic, will be reward deeply. Also that final page is a great way to end the issue. It evokes the rage that Simon must be going through, it really makes Simon super intimidating. It’s that final page that would make me want to have the next issue immediately. Thankfully we only have to wait two weeks.